With more than 34 years in the heating and cooling business, Hoffman Heating & Cooling Inc. is dedicated to providing the best possible service for you and your family or business. You can count on us to provide you with a system and solution that fits your family’s unique needs, and since we’ve installed many systems in this area, we’ve earned a reputation for doing the job right the first time. 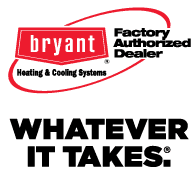 Second, we offer products from the leader in home heating and cooling equipment, Bryant Heating & Cooling. From air conditioners to furnaces to indoor air quality products, we have an HVAC system to meet your needs. Third, we train each employee to see your job through from start to finish, making sure the unit or system performs to your expectations. Our service technicians are NATE certified, meaning they’re the best in the trade when it comes to knowledge and experience in installing or servicing your system. Finally, we provide quick, professional service and complete maintenance plans to keep your systems operating at peak efficiency. It’s all part of our tradition of great customer service—we assure your complete satisfaction.